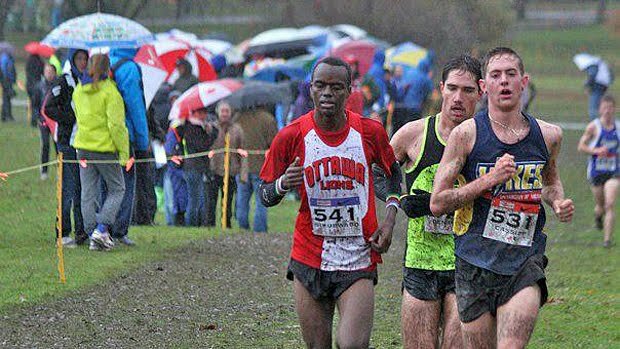 Here's an article that describes the Canadian Junior Cross Country championship race over the weekend. Rob Denault red-shirted during cross country season as a freshman at Villanova this fall. He is pictured above in the black and green singlet. Also of note, former Villanova harrier Sam Pawluk finished 8th in the Senior Men's race, covering the 10 kilometers in 33:22. Rob Denault finished second in a field of 167 competitors to help the Newmarket Huskies to second place in the men’s team standings at the rain-soaked Canadian cross-country championships Saturday at Jericho Park in Vancouver. Denault, a freshman at Villanova University in Philadelphia, covered the muddy eight-kilometre course in 26 minutes, 22 seconds, finishing two seconds behind winner Ryan Cassidy of the University of Victoria Track Club. Teammate Dylan Brown placed 15th as the Huskies finished behind Windsor Legion Track and Field club. Combined with a fifth-place finish by the junior women’s team, the Huskies earned their fifth straight Athletics Canada junior club of the year title, claiming a share of top spot with Ottawa Lions. Caileigh Glenn turned in the top result among Huskies women, finishing eighth among 116 runners. In masters, Geoff Peat’s sixth-place finish helped the men’s 40-and-over team to victory in overall team standings. Chris Deighan, Tom Callaghan and Jim Freemantle rounded out the roster. The Huskies quartet of Ken Hamilton, John DeFinney, Tim Payne and Murray Hale also captured top spot in the men’s over-60 division category.